Sorry I've been a bit absent in recent weeks, folks! It's been a busy one, S and I made a resolution early this summer that we would do our best to get out of the city to hike and swim as much as possible, and we've done a pretty good job of it! We've been out in the country camping essentially every other weekend since June. To make up for all that travel, during the week I've been picking up as much work as I can, making very little time for creating and photographing tasty treats for y'all. 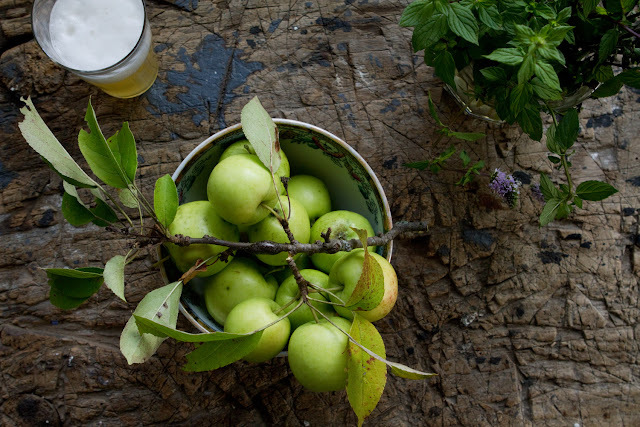 The weekend before labor day, however, the wonderful food stylist Frances Boswell, who I've been assisting on a very cool long term project over at Martha Stewart (shhh, I can't tell you what it is yet), asked if S and I would like to stay in her country home in Connecticut. Of course we said yes. And we had just a lovely time. On our very first day we went for a hike nearby and found a wild apple tree heavily laden with fruit. S boldly sampled one, and found the apples to be less bitter than your typical wild apple, tart and crisp with a light sweet note. I quickly filled S's handkerchief with a dozen of the little guys, tied them up into a little package, and tucked them away for later. 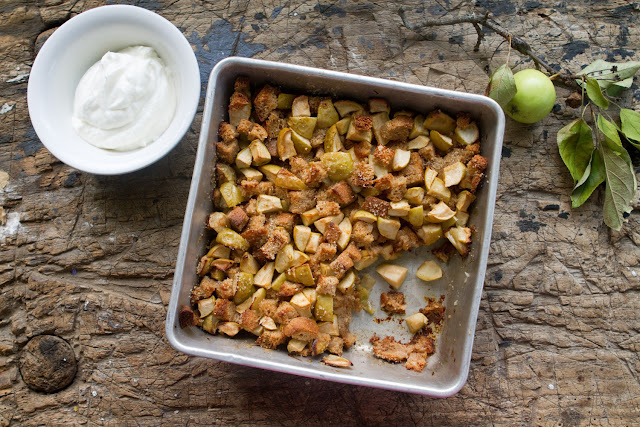 Back at the house I planned to make baked oatmeal, but we hadn't brought any oats, and a quick glance through the kitchen cabinets didn't produce any, so I surveyed our groceries, thought about what my mother would do, and in short order I was assembling an Apple Brown Betty. This was one of my mother's wintertime treats when I was a kid. Soft, buttery bread layered with baked apple and all coated in ooey-gooey melty brown sugar. 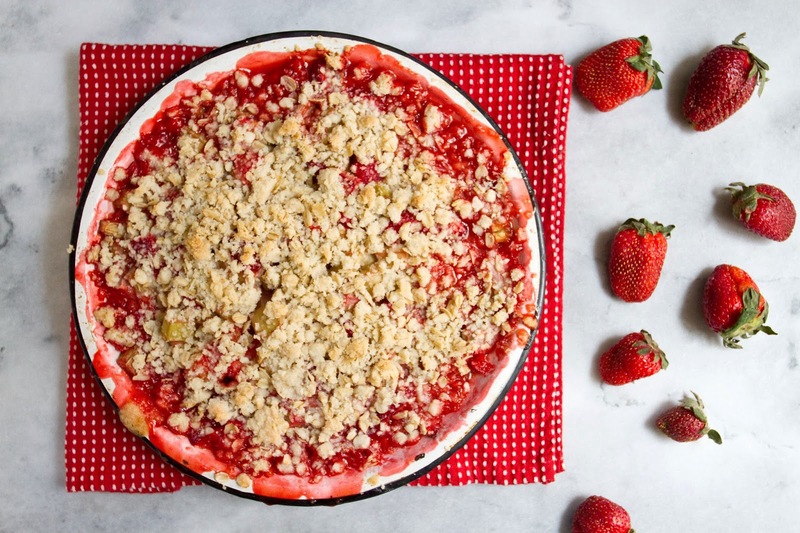 S and I enjoyed big bowls of Apple Brown Betty topped with fresh whipped cream out on the deck, watching the moon rise over a field of wild flowers. The wild apples were lovely when baked, and barely needed any sweetening, they were soft and juicy and just perfect. 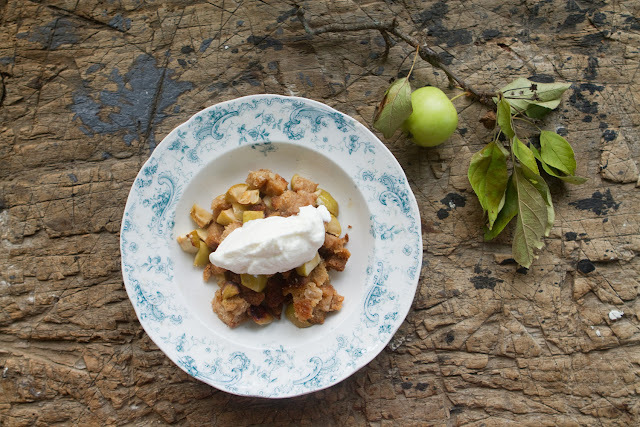 No need to go searching for a wild apple tree however, you can use any type of apple you like in this dish. Enjoy! Preheat the oven to 375F and generously butter a 8" baking pan. Core the apples and cut into 1/2" cubes, toss with 2 tbsp of the brown sugar, set aside. Cube the bread into 1/2" cubes. Cut butter into small pieces, smaller than the apples or bread. 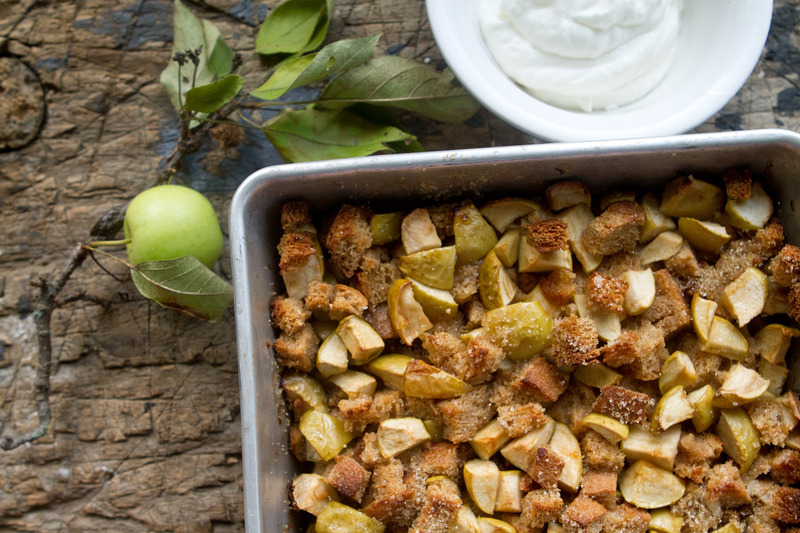 Sprinkle a layer of bread, top with a layer of apple, then sprinkle with butter pieces and brown sugar, then continue with another layer of bread, then apples, then butter and brown sugar until all are used. In a small bowl, combine the vanilla extract and water and stir together. 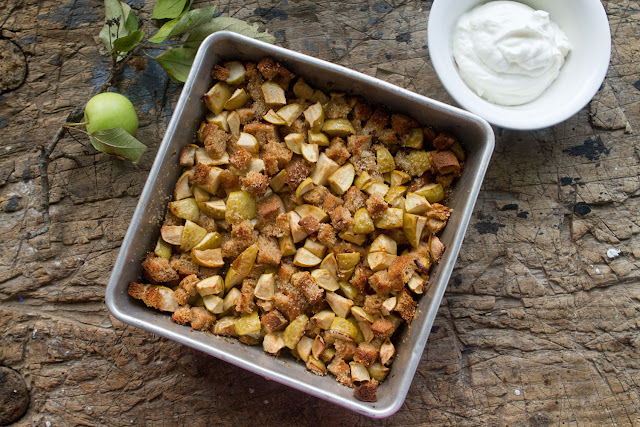 Using a spoon, sprinkle the water over the entire surface of the brown betty, then cover with aluminum foil and bake for 35 minutes, remove cover, and bake another 5 minutes until brown and toasty on top. 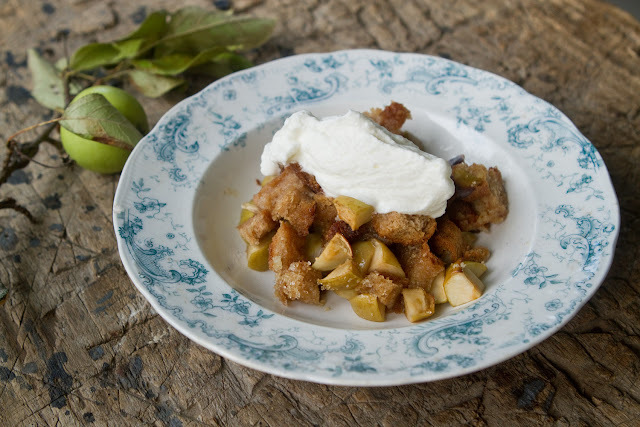 While apple brown betty bakes, whisk together the heavy cream, vanilla, and powdered sugar until soft peaks form. Top each serving of Apple Brown Betty with a healthy dollop of whipped cream. Enjoy! 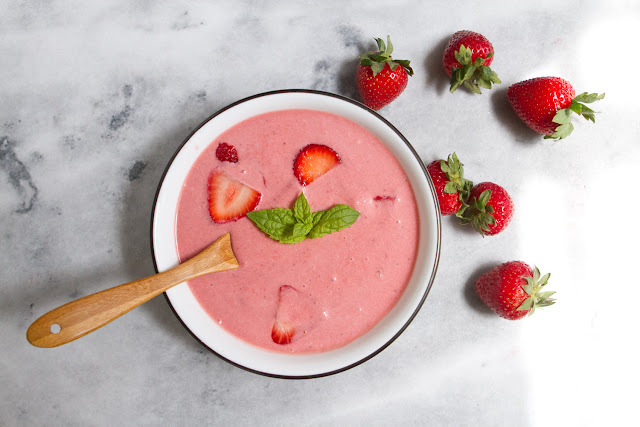 Creamy, sweet, berry-filled, pale pink strawberry soup is one of my most nostalgic foods. Growing up, my mother and I would enjoy a bowl of this heavenly creation at a little cafe called Sweetwater Landing in Ohio, I loved it. What kid wouldn't love a cold, sweet version of soup? It was like dessert for lunch. When I was thirteen my mother took me on a cruise to Mexico, which seemed like the ultimate height of luxury to my tween-brain, after all Mary Kate and Ashley Olsen made a movie set on a cruise ship! This was definitely going to be both an adventure at the high seas, and a very luxurious trip! So, imagine my excitement when we went to lunch in one of the ships cafes and the second dish the waiter brought out was strawberry soup! This was a more grown-up version, with mint on top, and a bit of a red wine flavor. I devoured two bowls. We were on one of those ridiculously gluttonous, wildly decorated, super dated 80's-90's style cruise ships. The carpet was a riot of swirling primary colors and the dining room was as glittery and reflective as a disco ball. There was a tiki bar on the leto deck. In the dining room, the waiters wore tails. You could get as many orders of any dish as you wanted. They would've probably brought me 5 bowls of strawberry soup if I'd asked. One night I ate two steaks. 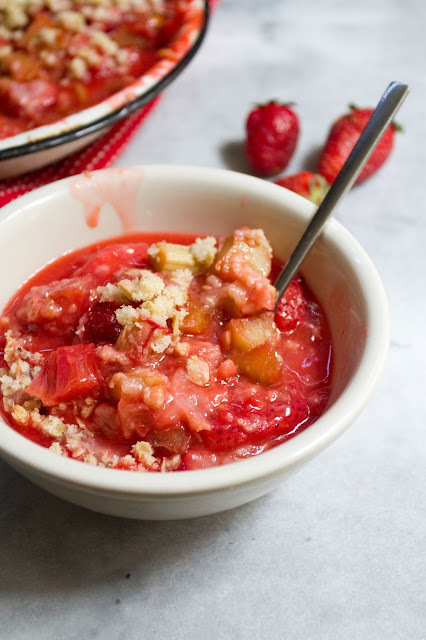 When I got home I became possessed with making strawberry soup, and in the following 14 years I've tried at least 7 recipes (including one that got you drunk after two bowls), but the one below is an amalgamation of them all, and is my favorite. Strawberry soup is definitely a retro kind of dish, it seems like something that would've been served at a fancy dinner party in the 1970's in someone's house with an astroturf living room with one of those leather Eames recliners, but that's what I love about it. I have astroturf as carpet in my bedroom. 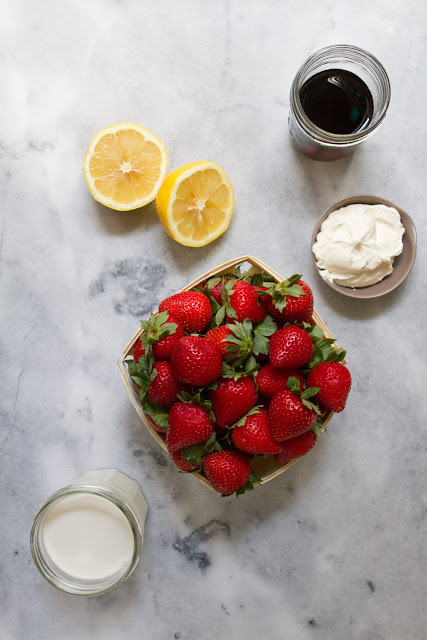 And besides, strawberries are insanely delicious, and heavy cream and red wine only improve dishes. 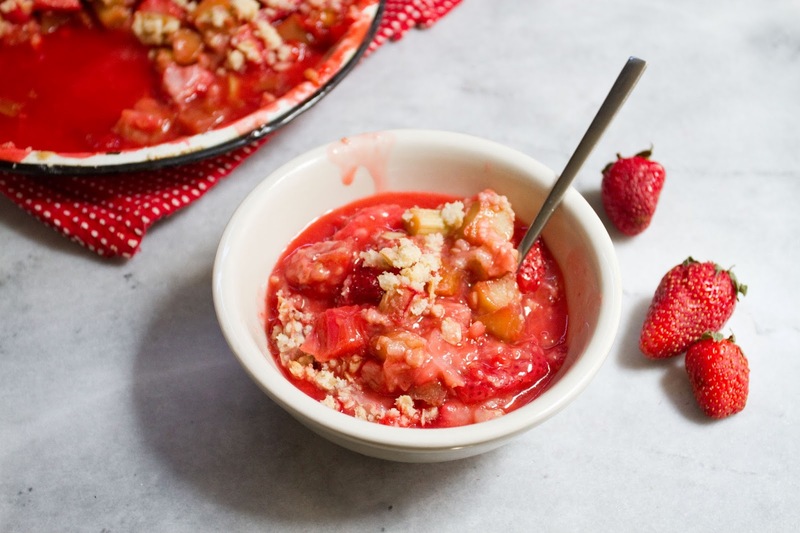 The texture is creamy and luscious, the strawberry slices are delightful, and it's cold, making it the perfect dish for these hot August days! 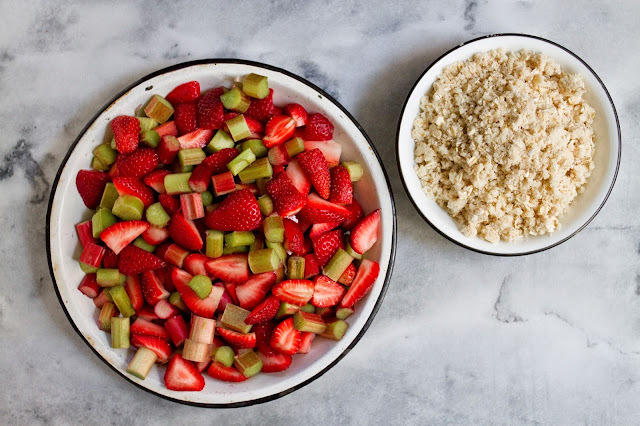 Remove the tops of all the strawberries, and slice strawberries until you have 1 Cup of slices, set these aside. Roughly chop the rest of the strawberries (about 4 Cups) and place in a medium sauce pan. Add to the pan the sugar and the lemon juice. Heat over medium low until all the sugar has dissolved and the strawberries have released some of their juices, about 2-3 minutes. Turn the heat to medium and add the red wine. Cook over medium heat for 2-3 minutes, stirring occasionally, then remove from heat and allow to cool for 5-10 minutes. Using an immersion blender, or a regular one, puree the soup until smooth. Cool the soup in the refrigerator (or if you're impatient like me, place the pot in an icebath and stir it), until cool, then stir in the heavy cream and sour cream until smooth. Fold in the remaining strawberries, reserving some for garnish if you'd like. 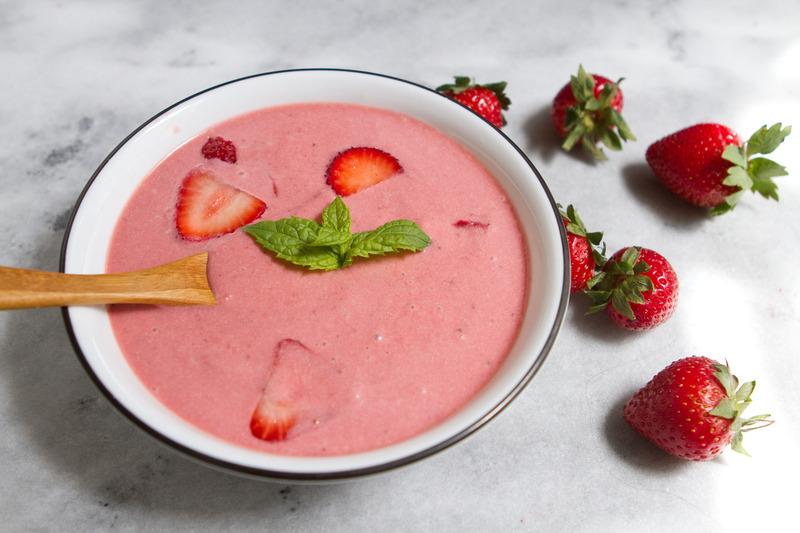 Serve chilled, topped with reserved sliced strawberries and mint, if you'd like. Enjoy! *A note about the wine- you can add more wine if you want, sometimes I add a whole cup and cook it down a bit more. In fact, you can add 1 1/2 cups and then cook it a bit less and the soup becomes like a soup-cocktail hybrid. Just in case you want to get a little tipsy at lunch. 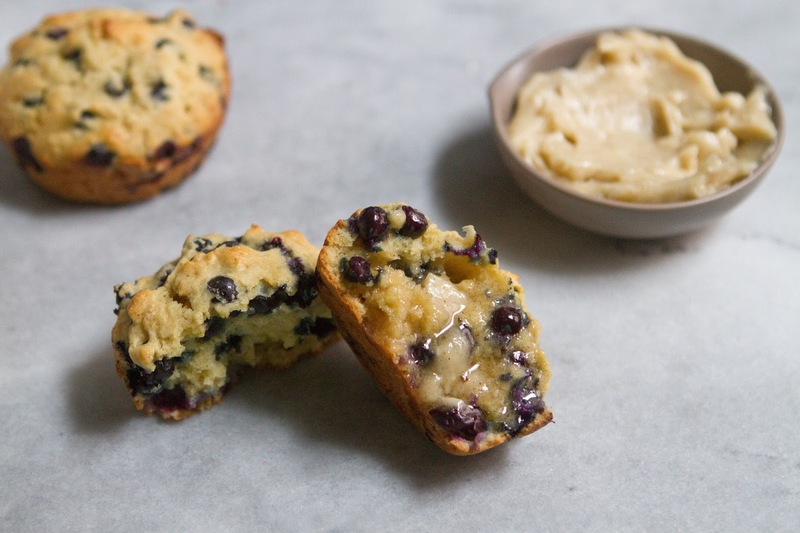 Is there a more classic, more universally loved muffin than the blueberry muffin? 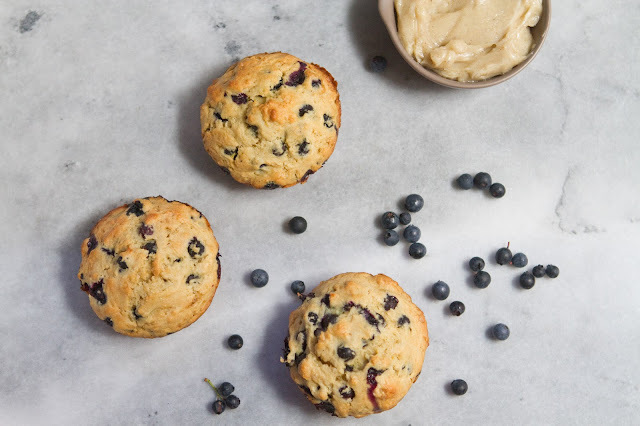 No one dislikes a blueberry muffin. Delicious sweet muffin batter paired with juicy, lightly tart berries- what's not to like? I like them so much that this is my second blueberry muffin recipe on this blog. S and I like to spend as many summer weekends as possible at our favorite campground, staying in the massive, two room, six person tent we jokingly call our summer home. We pitch this palace of a tent in our very favorite spot, beneath the towering trees in the sands of the Pine Barrens in New Jersey. You may be thinking New Jersey is a weird place to call your favorite weekend getaway, but the Pine Barrens are something else. Despite New Jersey being the most densely populated state in the country, the Pine Barrens are about as close to the middle of nowhere as you can get within 100 miles of New York City. Once you exit the highway, you drive through several tiny towns, then you pass the commercial berry farms stretching for miles, then the buildings where the migrant workers live, and the grassy airstrip where little private planes and crop dusters sometimes land, then finally you pass into the barrens. There's nothing but pine trees, blueberry bushes, sand roads, and little tea-colored rivers with cranberries growing all along their banks as far as the eye can see. We hike down sand roads with our inflatable inner tubes, occasionally hitching a ride with a ranger to our put in point, then float down the river on the tubes, plucking berries off the low hanging branches of giant blueberry bushes and snacking on them as we drift slowly by, and sipping Great Lakes Brewery beers that we pick up from a certain discount liquor store on our way. At our campsite we swing in our hammocks, I build a rip roaring campfire, and we roast sausages or cook up cowboy chili for dinner. And in the mornings, before the heat sets in, we pick blueberries. They grow everywhere in the barrens, surrounding every camp site, and we usually fill at least one quart sized container to take home for the week. As we were packing to head back into the barrens last week S pointed out that I hadn't used up the rest of the blueberries from the week before, and as I already had a whole quart frozen, I decided I'd use these while they're fresh. 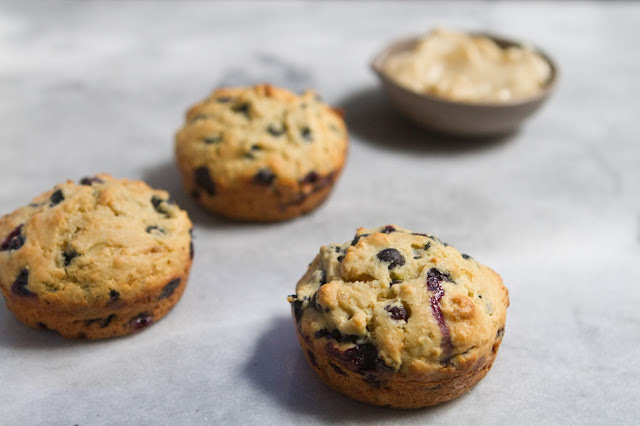 So I whipped up these muffins, using cornmeal because I love a good corn muffin, and lemon zest to add a little bit of zing to the sweet wild berries. They were heavenly, like a little bite of the countryside here in the heart of Manhattan! 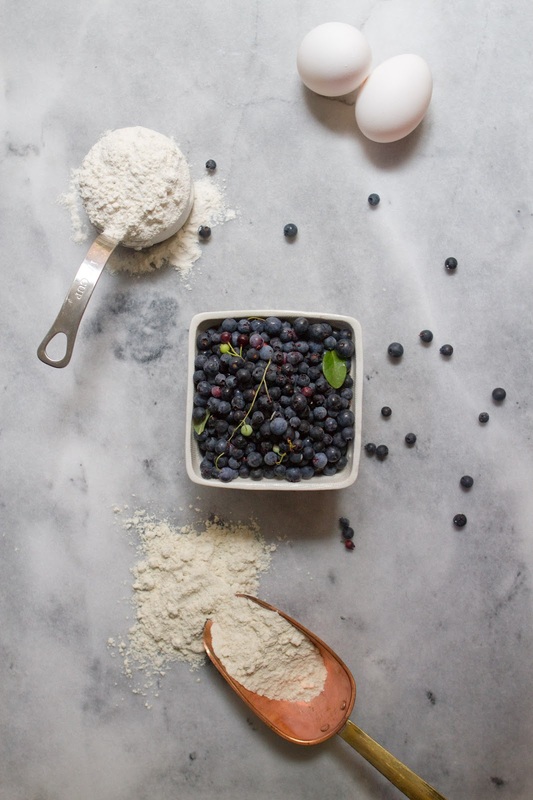 Place the blueberries in a medium bowl and toss with 1 tbsp flour, set aside. In a large bowl, whisk together the rest of the flour, the cornmeal, sugar, baking powder, baking soda, and lemon zest. Set aside. Add the greek yogurt, sour cream, or creme fraiche to a 2 C measuring cup, then add enough milk to make 1 1/4 C, mix well until smooth. Add to a medium bowl, along with the eggs, honey, vanilla, and melted butter. Whisk until well combined and a bit frothy. Stir wet ingredients into the bowl of dry ingredients until everything has just blended into batter. Gently fold in the blueberries until just combined. 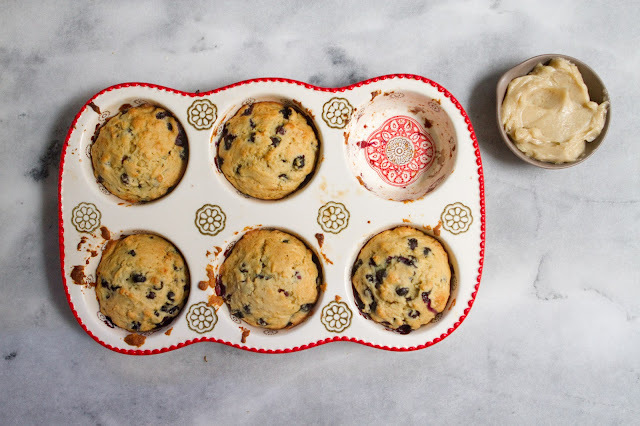 Either grease a muffin pan, or use muffin tin liners. Spoon batter into muffin tin until cups are 3/4 full. Bake 12-15 minutes, until muffins are golden brown, and a toothpick inserted into the center of a muffin comes out clean. 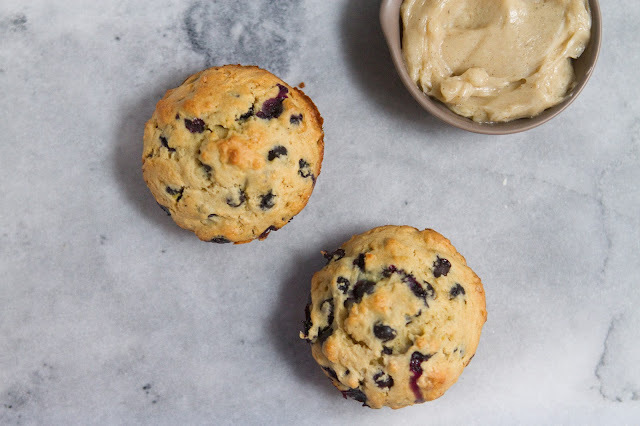 While muffins bake, combine all honey butter ingredients in a small bowl, mix with a fork until all ingredients are combined, and either spoon into a bowl and keep at room temperature for soft butter, or roll into a log using parchment and pop in the fridge if you prefer cold butter. 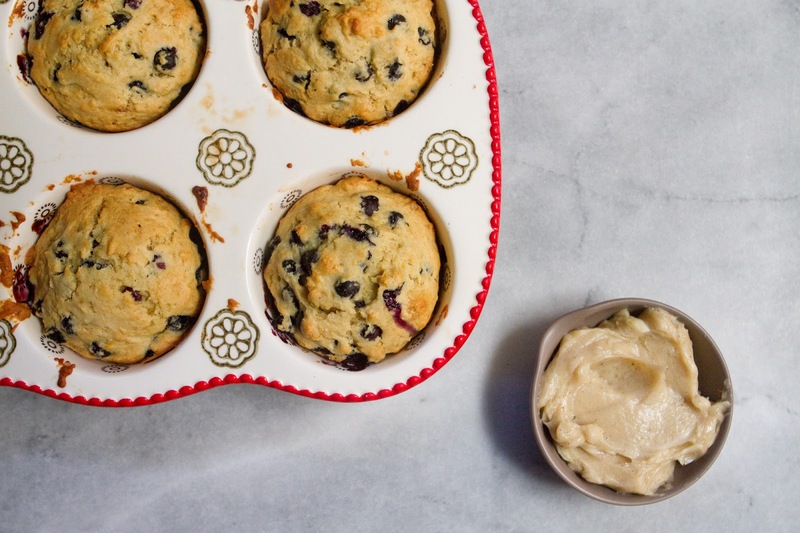 When muffins are ready, remove from oven and place on a wire rack to cool for 5-10 minutes, then enjoy! 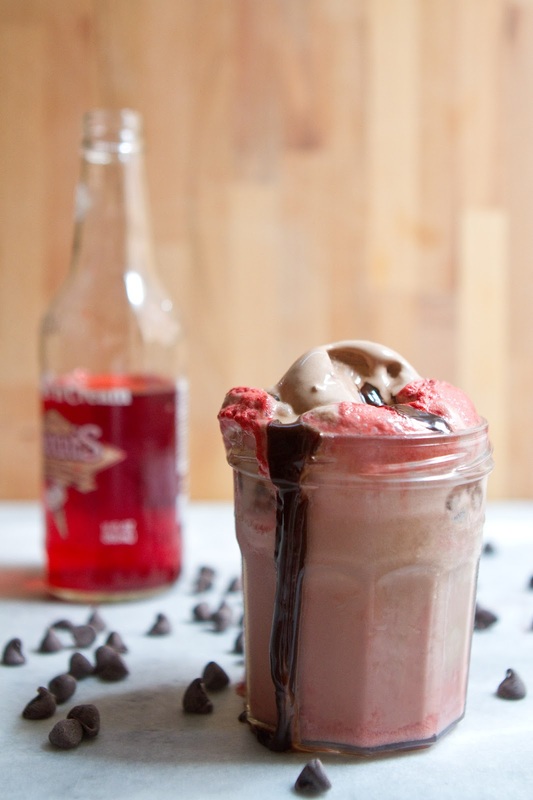 Lets talk about ice cream floats. Did you know they're pretty much the perfect dessert? 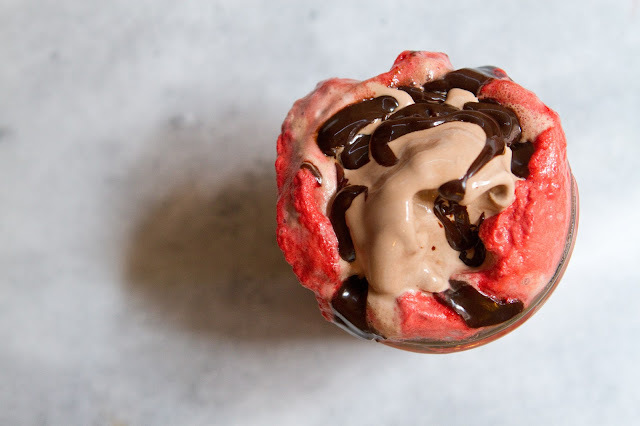 You can make them with a myriad of ingredients that can be found at just about any corner store, they come together in a snap yet look decadent as heck, and they're just so delicious. So, so darn delicious. 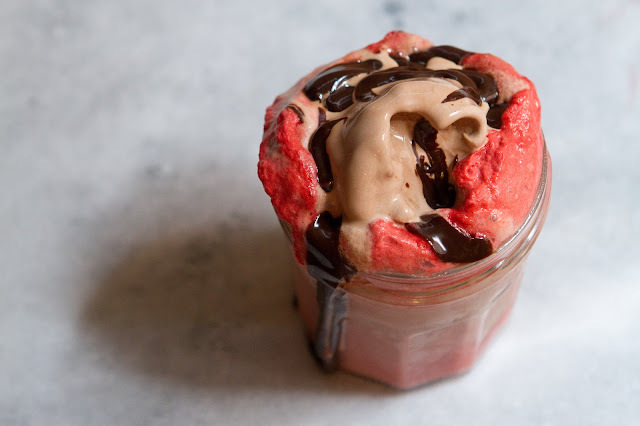 There's the ever-popular root beer float, the chocolatey brown cow, the tasty Coke float, there are vegan variations, and even Butterbeer copycats. I love all variations of the ice cream + soda combination. 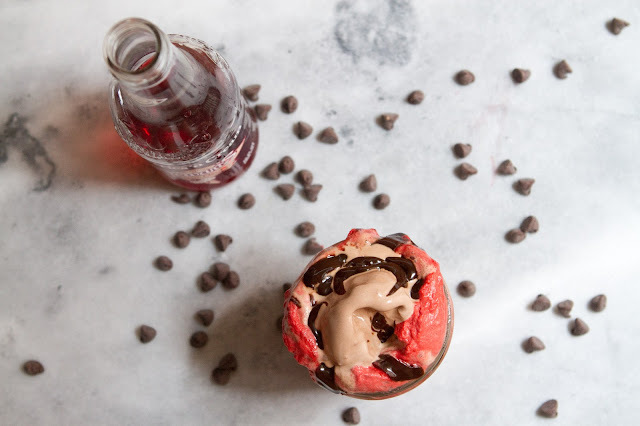 For a while as a kid I loved to get classic ice cream sodas at a local place, where you chose any type of ice cream you liked, and they topped it with with a fruit or chocolate syrup, and plain soda water. I really liked, at this ice cream shop, to get a rich chocolatey ice cream, and a fruity syrup, like strawberry or cherry. 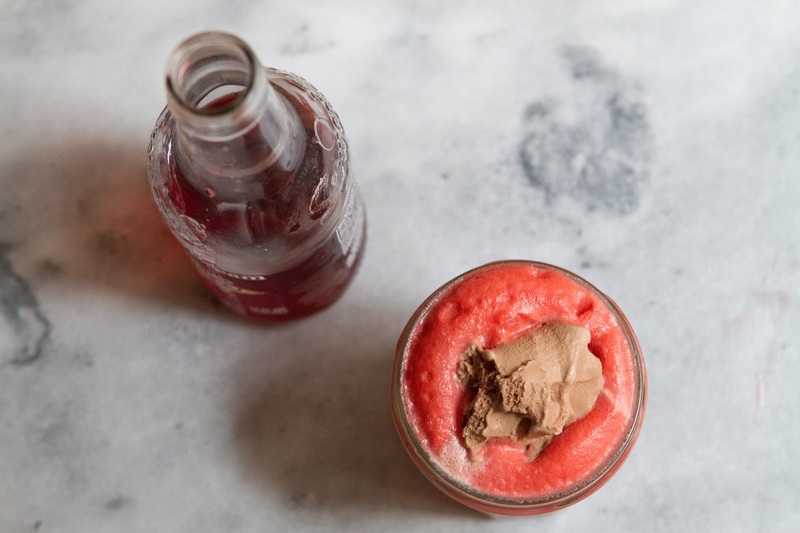 The deep, decadent chocolate ice cream would melt into the fruity, crisp soda in a really phenomenal way. And the fruit syrup would turn the soda foam a really gorgeous shocking hue. This float is my homage to that childhood treat. You can use absolutely any type of chocolate ice cream you like, I went with a classic- Haagen Dazs Chocolate, but I think a really rich dark chocolate would be lovely- or even a dark chocolate sorbet. Similarly, use any cherry soda you like. You could even use cherry cola, though it will produce a browner foam. I used Stewarts Cherries 'N' Cream soda, which was delightful. 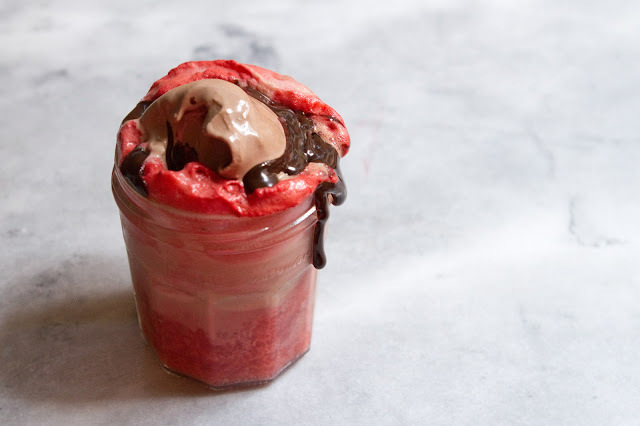 This recipe is super simple- you only have to cook the hot fudge, and you could do that in a microwave if you really wanted (just run it in short increments at 70% power, mixing often). 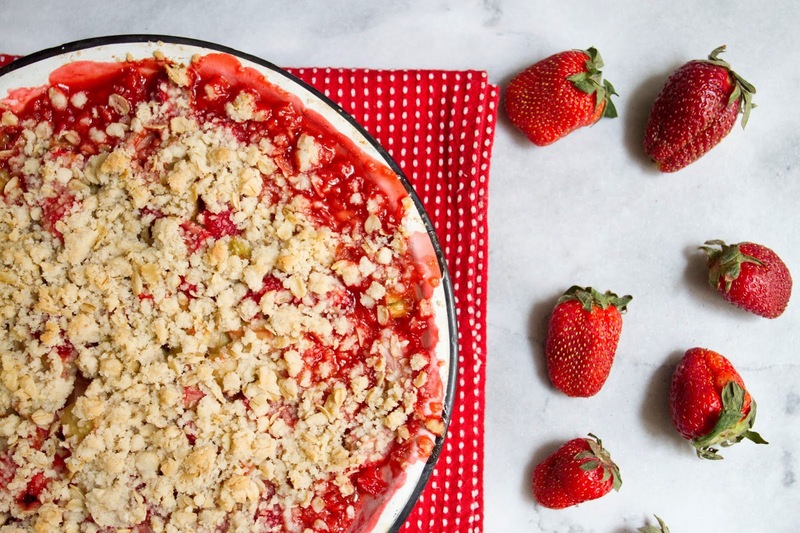 It's very short cook time makes it an excellent choice for a summer dessert. You could even make the hot fudge ahead of time and just zap it a moment to rewarm it before serving, bringing your prep time down even lower! I hope you enjoy this delicious little treat as much as I did! First, make the hot fudge. In a small sauce pan, melt the butter. Stir in the chocolate chips, and when mostly melted, mix in the sweetened condensed milk. Stir for a bit until glossy and smooth. Set aside. 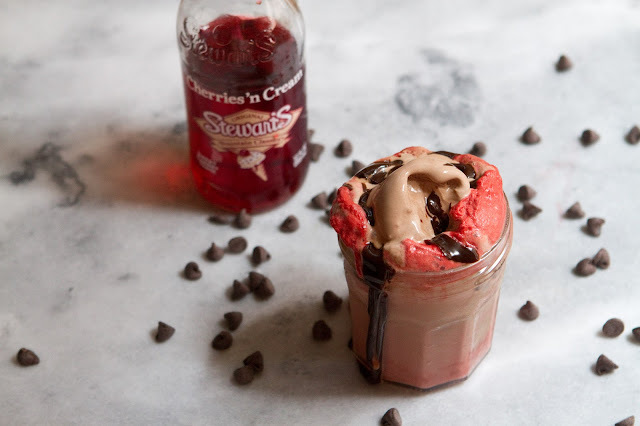 Put 1 Scoop ice cream in each cup, pour 1/2 a bottle of soda over top (tilt your cup and pour slowly to avoid fizzing over), top with another scoop of ice cream and drizzle with hot fudge. Enjoy! 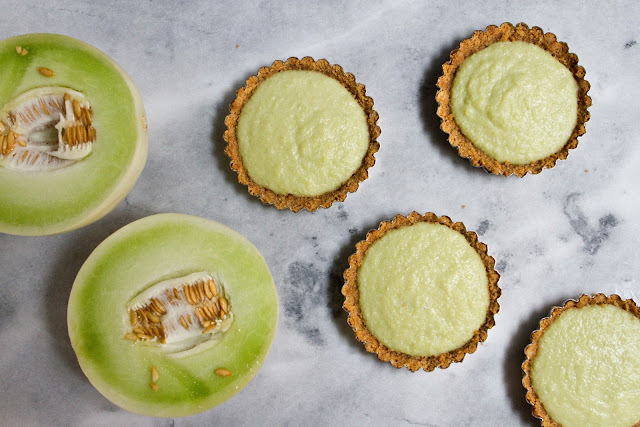 Juicy, cool, pale green honeydew melons are the perfect treat on a hot summer day. Something about cracking open a giant melon just screams summer to me. The watery, juicy flesh quenches that unquenchable hot-july-day thirst, and their gentle honeyed sweetness just shouts of dewy summer mornings. 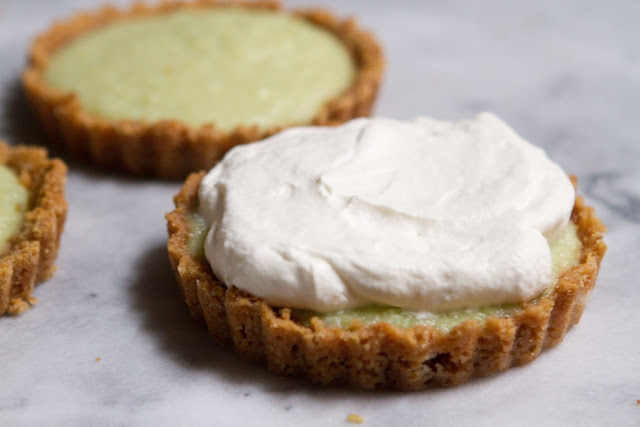 It was with melon's summery spirit in mind that I made these tarts. 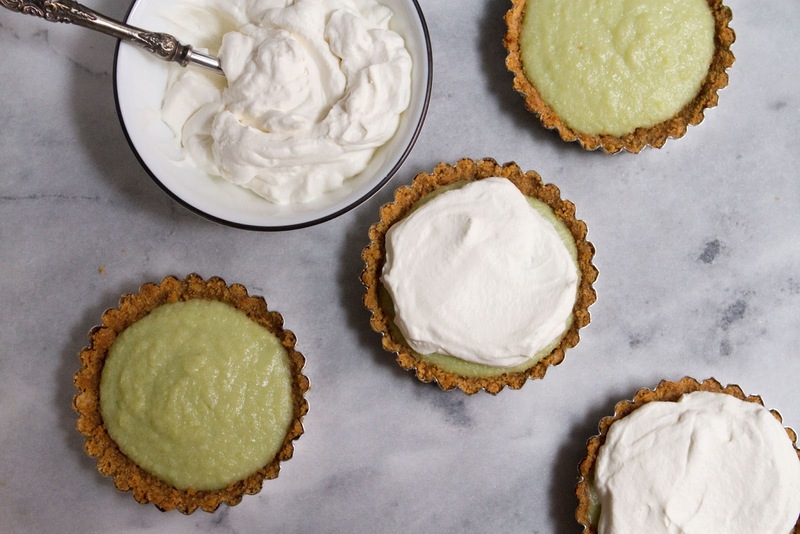 They're a lovely marriage of summery green honeydew and rich, indulgent vanilla custard. I love custard. Creamy, thick, perfectly-eggy vanilla custard pairs well with pretty much any fruit, and with honeydew it's a match made in heaven. 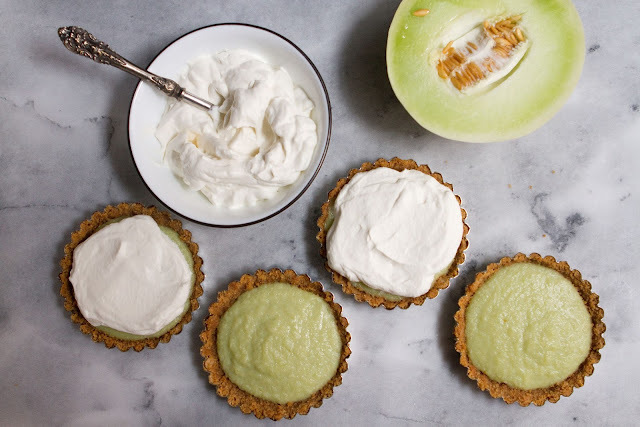 The custard gives the honeydew a nice body, a delightful creamy richness, turning the juicy melon into a velvety, smooth pudding that still maintains it's summery fresh flavor. Think of these as summer's answer to a pumpkin pie. All that creamy consistency and rich flavor, but instead of autumnal gourd, this tart offers up crisp fresh melon notes. I would serve these at a backyard dinner party, on a big table set with lots of lanterns, big glasses of prosecco, and fresh peonies- that is, if I had something as luxurious as a backyard. As is, S and I took them up to our DIY-terrace (ie. our bare roof, where we keep plastic lawn furniture), and enjoyed them after dinner while the sun set, and that was pretty spectacular too. 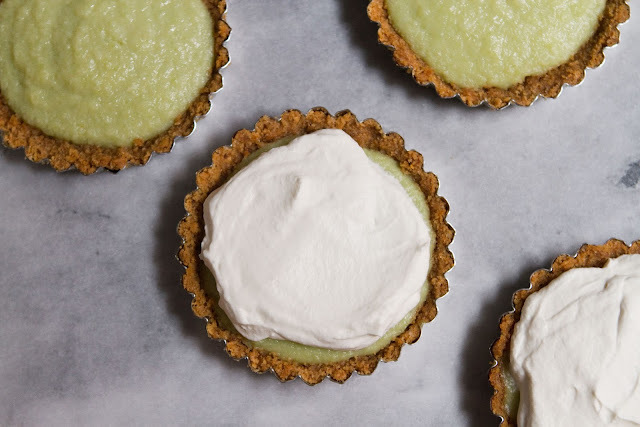 Anywhere you serve them, these tarts are guaranteed to please! First make the crust. Preheat oven to 375F. Butter 1 large, or 4 small 4 inch tart pans. Melt the butter, and in a medium bowl combine graham cracker crumbs, butter and sugar. Press into the buttered tart pans until a uniform crust is formed. Bake for 8-10 minutes, then remove and allow to cool on a wire rack. Peel, chop, and cube the honeydew melon, then place in food processor and puree until smooth. Heat over medium low heat, stirring constantly, until mixture thickens, about 9-13 minutes. Pour the custard into the tart pans until almost level with the top of the crust. Place in refrigerator and allow to set for 2-3 hours. 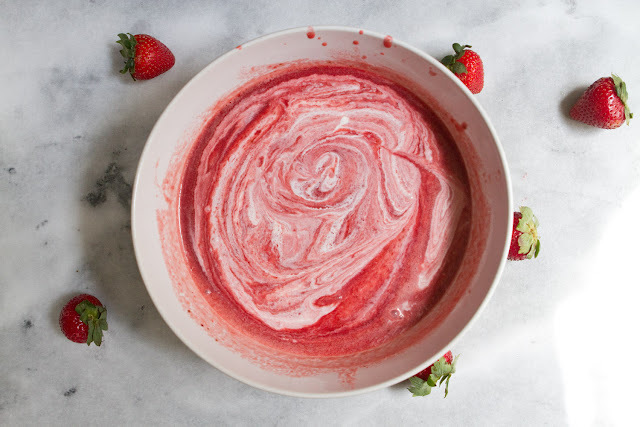 Before serving, combine the heavy cream and powdered sugar in the bowl of a stand mixer, and using the whisk attachment mix on medium-high speed until soft peaks form. Spread a 1/2 inch thick layer over each tart. Enjoy! 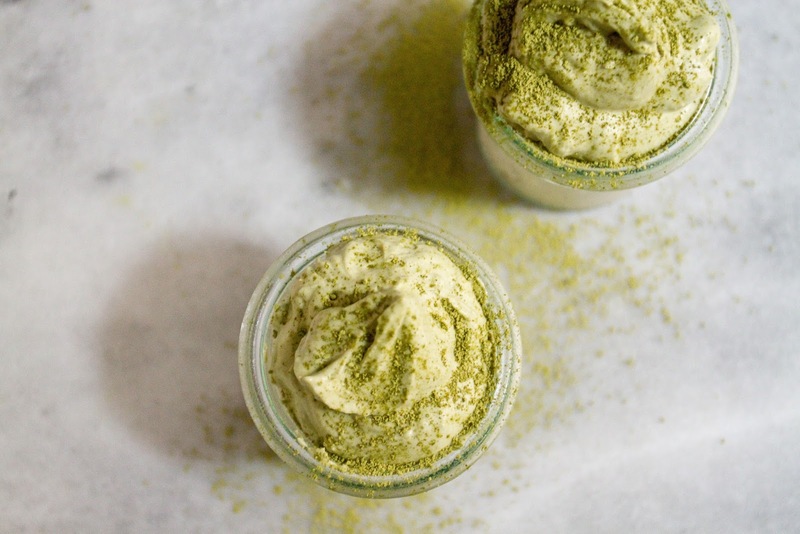 These light and creamy panna cottas, with their fluffy texture and delicate matcha-coconut flavor are the perfect dessert to beat the summer heat. They only require about five minutes on the stove too, so you won't heat up your kitchen too much whipping these up on a hot day! S loves matcha. 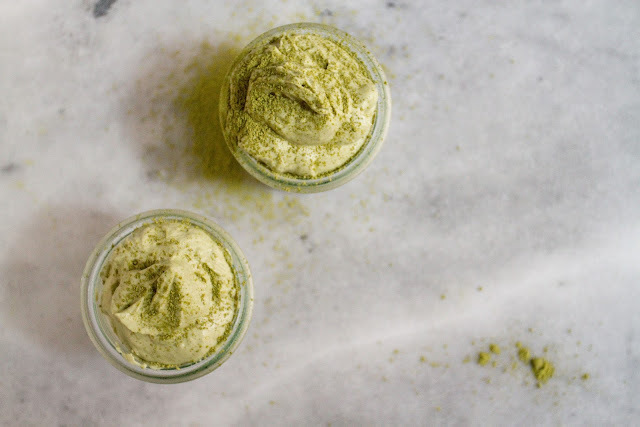 He loves my matcha sandwich cookies, and matcha date bars, he loves matcha boba slushes, matcha lattes, matcha sponge cakes, matcha just about anything. We even have a 1 kilo bag of top-notcha matcha powder he bought a few months ago to his own matcha lattes. Meanwhile, I'm not a huge fan. I like green tea, and I like matcha lattes, but it's taken a while for matcha flavored treats to grow on me. But oh, these panna cottas break the mold for me. I love these! The matcha is all in the whipped topping so it's light and creamy, and tastes quite a bit like a matcha latte made into a lovely fluff piled up top of a dainty, airy coconut panna cotta. The green tea doesn't overwhelm in this recipe, it plays really well with the creamy coconut and light vanilla notes, all three flavors shine through the creaminess of this delicious little dessert. 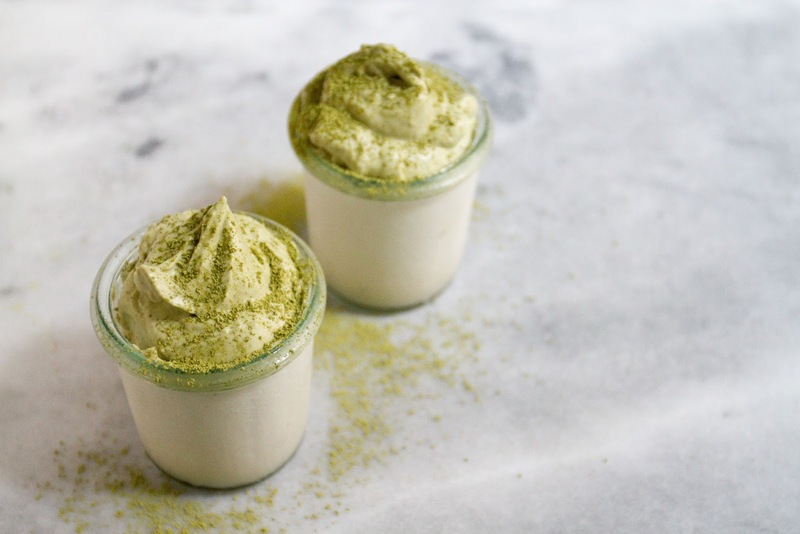 Sinking your spoon into one of these pretty little cups after a long day at work is a wonderful reward- the wiggly, sweet, coconut-vanilla panna cotta, and the fluffy, creamy, light-as-air matcha whipped cream come together to make a dessert worthy of a dinner party, but easy enough to make on any-old-tuesday. Enjoy! *A note about the coconut milk- It is really important that you do not shake or even turn upside down the coconut milk while or after it chills. Ideally, chill it overnight without disturbing the contents. Also you cannot use light coconut milk for the whipped cream part of this recipe, it's gotta be full fat. For the panna cotta, open the can of coconut milk, pour into a small pot, and add the sugar. 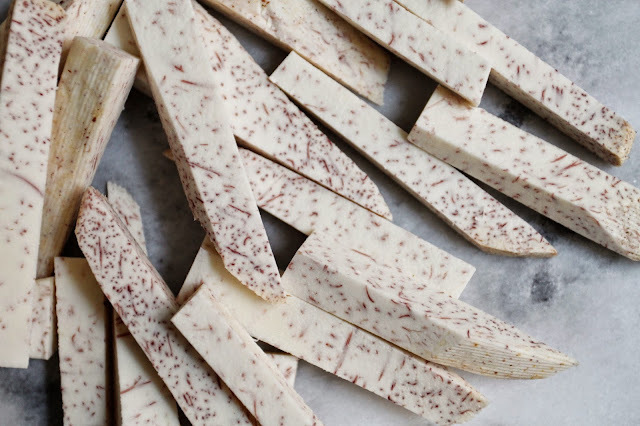 Slice open the vanilla bean, scoop out the flesh with a knife, and add to the pot of coconut milk. Then add the whole bean. Heat over medium-low heat, gently whisking, for 5 minutes. After 5 minutes, reduce heat to low, and in a small bowl combine 1 tbsp of water with 1 1/4 tsp gelatin or agar powder, mix well. Allow the gelatin to sit about 1 and a half minutes, while returning to slowly whisking the coconut milk. 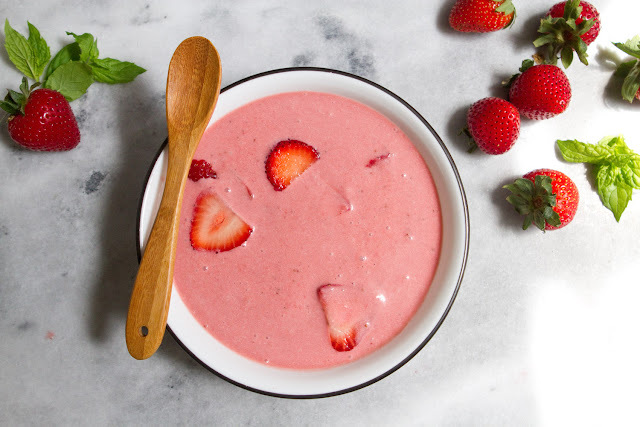 After 90 seconds, add the gelatin water mixture to the coconut milk, and while whisking, turn heat up to medium and whisk constantly for 2-3 minutes. Remove from heat and pour immediately into ramekins, custard cups, or another small container. Chill for about 4 hours, or until as firm as a nice wiggly flan. While the panna cotta chills, make the whipped cream. Take the very cold coconut milk cans that you've not been touching or shaking at all out of the fridge, and open them. If you've chilled them long enough and not shaken or inverted them at all, they will have a thick layer of firm, white coconut cream on top. 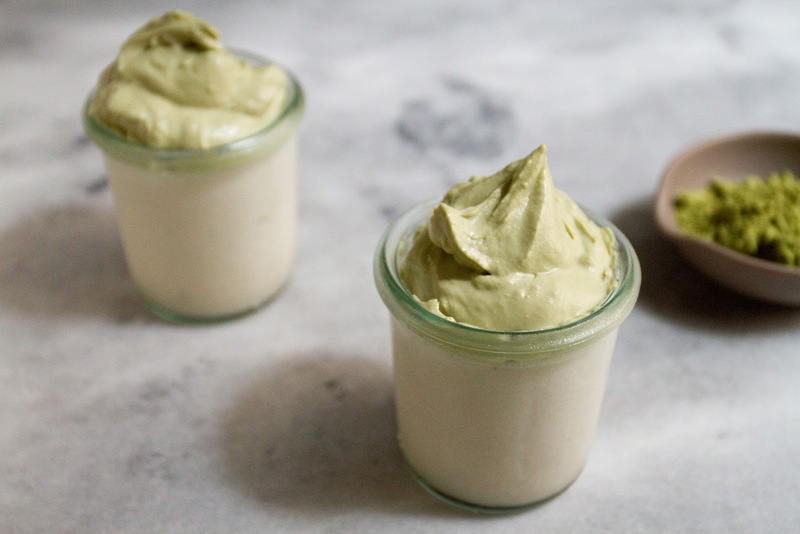 Skim this cream off both cans and put it in a bowl, or a stand mixer's bowl, (The liquid beneath the cream you can save to use in other recipes or put in smoothies). 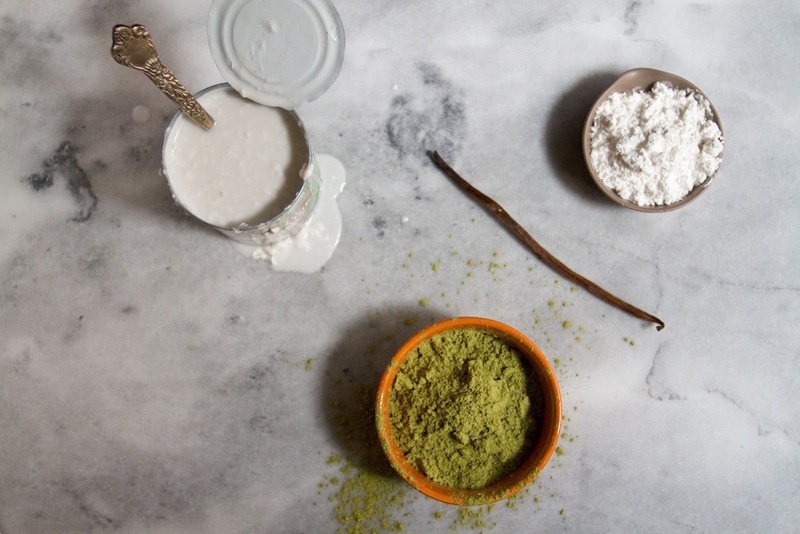 Add to the bowl the powdered sugar and matcha, then using a hand mixer, or your stand mixer, mix on high for about 3 minutes, or until soft peaks form. it won't get as stiff as heavy cream, but chill in the fridge until ready to use, and it will get a bit thicker, like cool whip. You can de-mold the panna cotta by dipping the containers 3/4 way into warm water for 5 seconds then inverting on a plate, or you can eat them straight from the ramekins like little puddings. 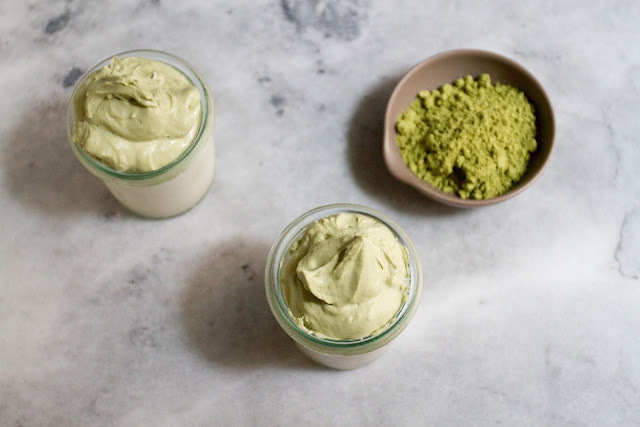 Either way, top with a generous dollop of matcha whipped cream and enjoy! Growing up, some of my very favorite books were Laura Ingalls Wilder's Little House novels. I was fascinated by the rugged way the Ingalls family lived- how they frequently lived a whole day away from the nearest town, how they could go weeks in winter without seeing even their own neighbors. And I was amazed by the ingenuity- the door PA built without any nails, the inflated pigs bladder the girls used as a ball, the way Ma could make one girls ripped dress into a baby dress, then when that tore, she made it into curtain trimmings. One of my all-time favorite scenes happens in the The First Four Years- shortly after Almanzo and Laura are married some threshers come to work on the farm, and Laura serves them all lunch every day. On the very first day, the first time she's ever entertained guests as Manly's wife- she forgets to put any sugar in her pie, and doesn't realize until it's far too late. When the first thresher takes a bite of his pie, he grimaces, then opens it up and spoons sugar all over it, while politely telling Laura he appreciates it when a cook lets a fellow sweeten his own pie. She is, of course, mortified. The pie is super sour, because this was not an unsweetened apple or berry pie, no, it was a "pie-plant" pie. 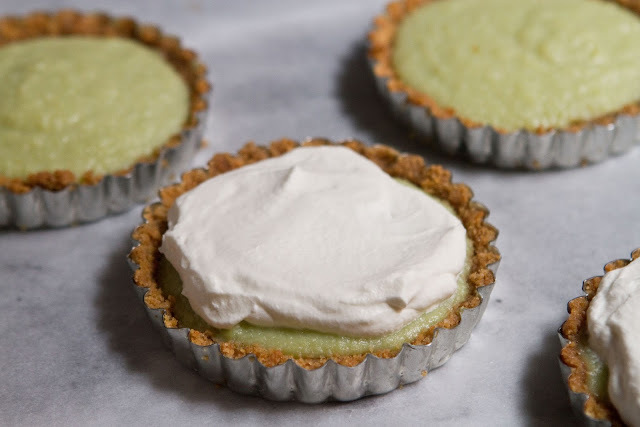 Laura mentions pie-plant a few times in the course of the books, but it wasn't until she described the unsweetened pie-plant pie as horribly sour, that I realized I knew of only one super-astringent-sour plant that is used mainly in pies: rhubarb. Rhubarb, unsweetened, is more than just tart, or sour, it's outright astringent. It doesn't take a ton of sugar to take the edge off that sourness, but you definitely have to add sugar. I can't even imagine the unpleasant surprise that thresher must've gotten when he pit into his pie! 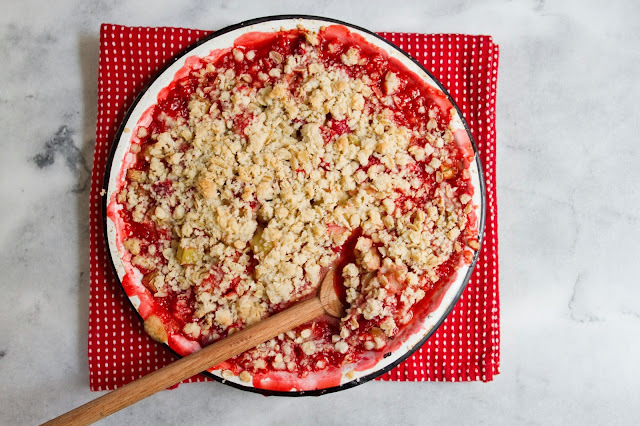 I've never had an all-rhubarb pie like Laura makes (sweetened or otherwise), my mother always made strawberry rhubarb pies when I was a kid. My mother is an excellent pie baker. She can make a buttery, flaky, sweet crust like, well, like only someone who was born before pre-made pie crusts were available can. Her strawberry rhubarb pies are the stuff of my childhood food nostalgia. However, on nights when dessert needed to happen quickly, when there wasn't time to make, and chill, and roll out pie dough, my mother made crisps. Her most common crisp was apple, but we also made berry crisps, and peach cobblers from time to time. Crisps, cobblers, and brown-betties all come together so quickly and easily, the deliciousness greatly outweighs the effort required to make them, which is why they've become a serious staple of my own dessert making. I whipped up this crisp one weekend when we some friends were dropping by, and it was gobbled up practically before I could taste it myself. It is delicious, the strawberries are sweet and soft, mellowing out the rhubarb, but allowing it to keep a slight, lovely, tartness. The crisp is lovely served on it's own, or with a scoop of vanilla ice cream. Preheat oven to 350F and grease a large pie pan or a 9x9" square pan. Chop the rhubarb into half-inch segments and place in a large bowl, remove the tops of the strawberries and quarter them, then add to the bowl. 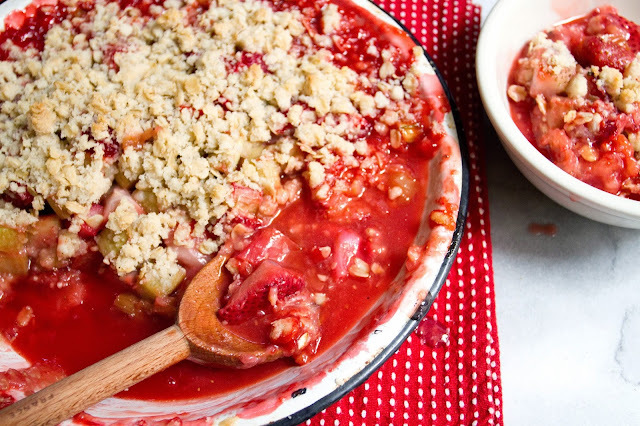 Sprinkle 1/2 C sugar over the rhubarb and strawberries, and gently mix. Set aside. 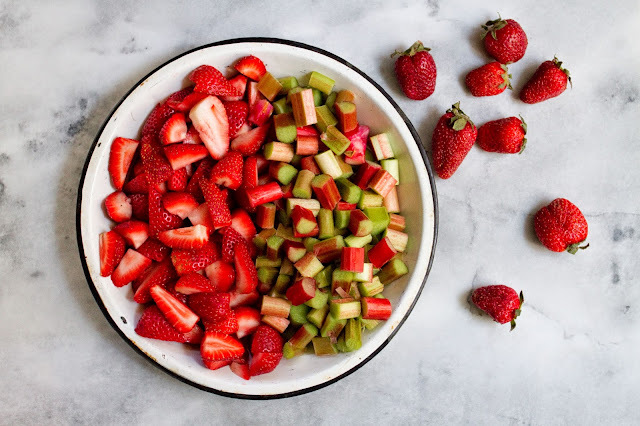 Combine the juice of 1/2 a lemon and the cornstarch and mix until smooth, pour over the berries and rhubarb, and mix gently until all fruit is coated in cornstarch mixture. Pour into the prepared pan, and spread out evenly. Set aside. In a small mixing bowl combine the oats, flour, cardamom, pinch of salt, and 2/3 C sugar, and stir until well mixed. Add the butter, and using a pastry cutter, large fork, or your hands, work the ingredients together until they are well combined and the mixture forms many little clumps. 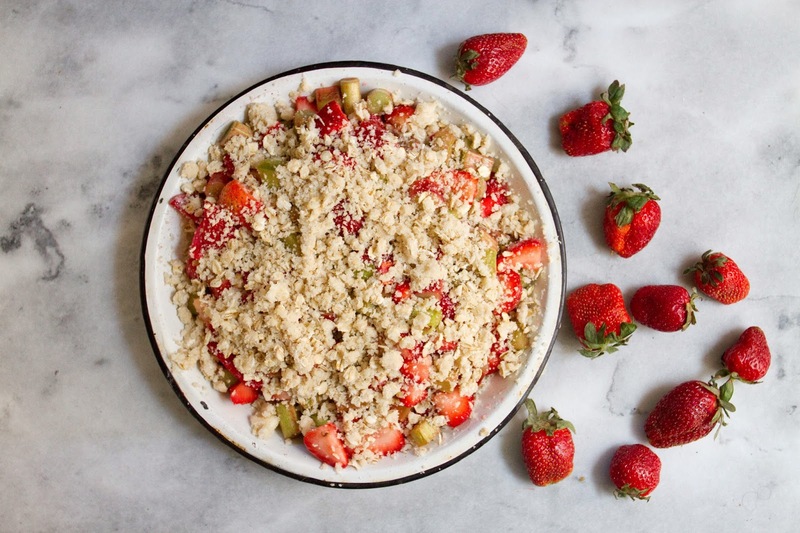 Sprinkle the oat topping over the pan of strawberries and rhubarb, until well covered, then bake for 40-45 minutes, until topping is golden brown and fruit is bubbly. Allow to cool 10-15 minutes, and serve warm. Enjoy! Taro is one of those flavors I didn't really discover until I moved to Chinatown. I first discovered the root vegetable in the form of a bubble tea. If you've never tried taro the idea of a root vegetable flavored sweet iced beverage may sound strange, but with taro, it just works. Taro bubble tea (or, a taro slush- preferably with lychee jelly), tastes a bit like cotton candy, and a bit like coconut, with perhaps a faint vanilla note. As does taro ice cream, also, both the ice cream and the bubble tea are usually purple. Actual taro tastes nothing like any of those things, and a lot more like a potato. It is, however, swirled with lovely purple bits. 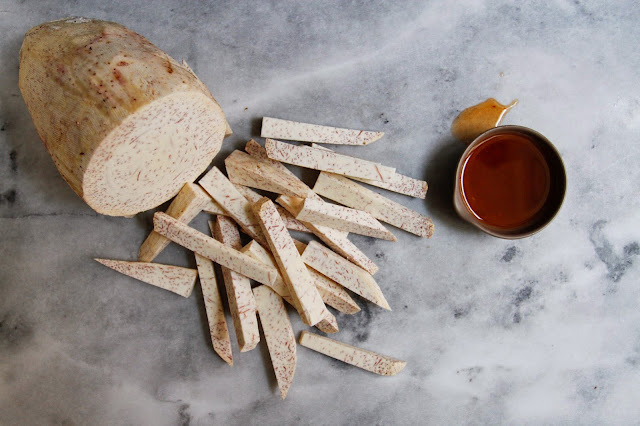 Taro, when served as a savory dish, tastes quite a bit like a white potato, but with a bit more flavor, and perhaps a dash of yam-like sweetness. However taro has a much lower glycemic index than white potato, is high in potassium and vitamin A, and has some great antioxidant properties. My first foray into savory taro was taro chips, which I love. Soon after I discovered taro fries at An Choi, a tasty Vietnamese spot by my apartment. It was there that S first suggested that we could make the fries ourselves at home. Taro is easily found in our neighborhood, as it's common in chinese cuisine, so if you can't find it at your regular grocery store, I would check your local asian market. The fries at An Choi are tossed in a spicy-sweet glaze that is heavy on the fish sauce. I wanted to maintain that same sweet-spicy-funky flavor, but cut down a bit on the fish sauce, allowing the taro flavor to shine more. The results are delicious. 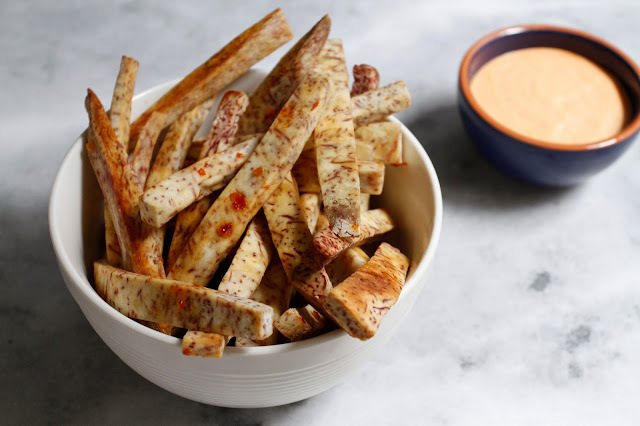 These taro fries crisp up wonderfully on the outside while the inside has a great texture, a bit heartier than regular white potato, and the glaze is delightful, a bit spicy, a bit funky, and with great sweet notes, it mixes really well with the creamy-spicy sriracha mayo. 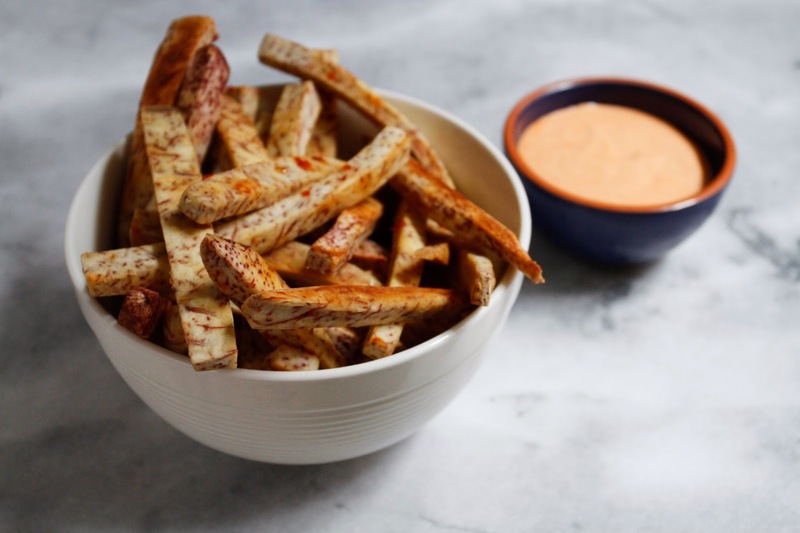 These fries make a fantastic appetizer or side dish. Or even an extra-tasty movie night snack. Enjoy! Preheat oven to 400 F, use a bit of olive oil to grease a large baking pan. Combine all glaze ingredients in a small bowl or measuring cup, whisk until well combined. Set aside. 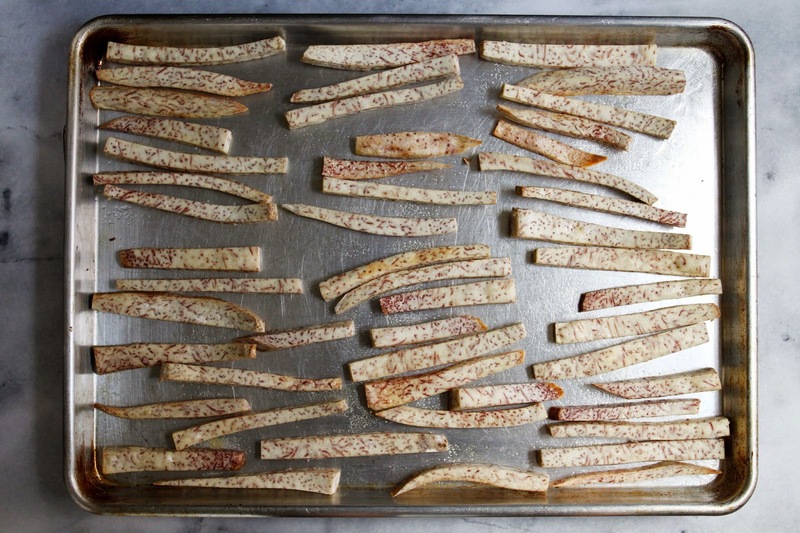 Peel the taro (it peels just like a potato), and cut into fries about 1/2" thick. Place in a large bowl, drizzle with 1 tbsp olive oil and 1 tbsp sesame oil, and toss well to coat. Spread fries out in a single layer on the greased baking pan, and sprinkle with salt and a bit of pepper. Bake for 20-25 minutes, until golden brown on the edges, and crisp on the outside. 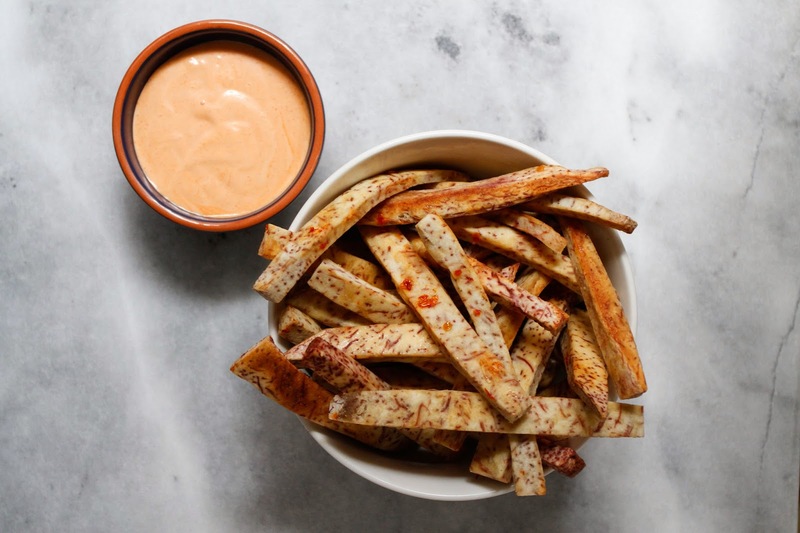 While the taro roasts, combine the mayo and sriracha in a bowl and stir until the sriracha is smoothly mixed into the mayo. Set aside. When you remove the taro from the oven, don't turn the oven off, you'll need it in a moment. 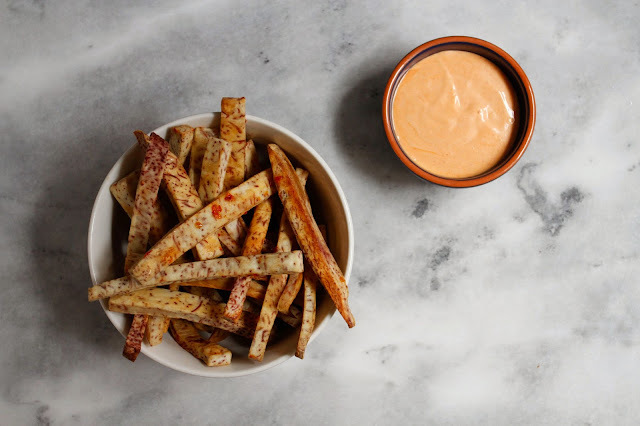 While the taro is still hot, remove it from the pan and pop it in a large shallow bowl, drizzle the glaze over the taro and quickly toss well to coat the fries in glaze. 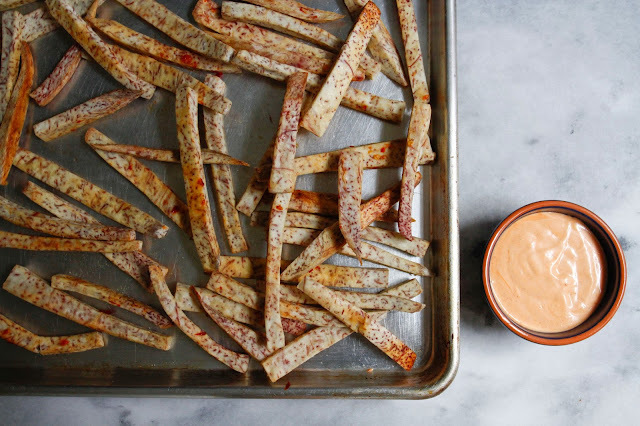 Spread the taro back out on the same baking pan (don't worry about it being too neat, they can overlap a little bit this time) and pop it back in the oven for about 4 minutes, to set the glaze, so the fries won't seem wet. Remove the taro from the oven after 4 minutes, and serve warm with the sriracha mayo for dipping.